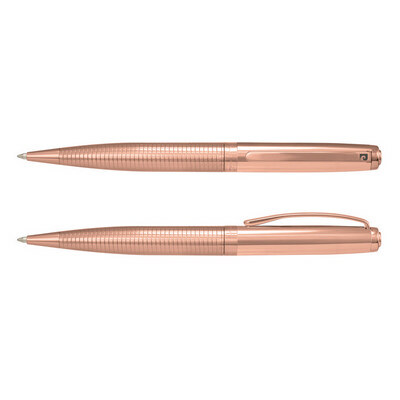 Sophisticated brass ball pen with a silky smooth twist action and stunning electroplated finishes. The lower barrel features a subtle guilloche engraved pattern and the upper barrel laser engraves to a natural etch. It has a black ink large volume refill with 4000 metres of German manufactured DOKUMENTAL ink and a tungsten carbide ball for improved writing quality. Lyon features the Pierre Cardin logo tastefully engraved on the centre ring and clip. It can be presented in an optional velvet sleeve or a superb Pierre Cardin gift box. Colours: Chrome, Gunmetal, Gold, Rose Gold. Dimension: Dia 11mm x L 137mm x 16mm (includes clip). Print Description: Position D & E - 35mm x 7mm. Print Type: Pad Print. Packing: Loose packed or an optional presentation box or sleeve. Price includes : 1 Col 1 Pos Print. Setup is included.